This collection reviews current advances in the breeding and cultivation of key tropical and subtropical fruits. Chapters summarise key advances across the value chain for citrus fruit cultivation, including citrus genetics, nutrition and other aspects of cultivation, the use of precision agriculture and developments in integrated pest management (IPM). Two case studies on limes and mandarins highlight the range of improvements in cultivation. The book also summarises recent developments in breeding and cultivation techniques for a range of soft tropical fruits, including banana, kiwifruit, lychee, papaya, pineapple and pomegranate. The final part of the book covers developments in breeding and cultivation techniques for a range of stone and other tropical fruit, including avocado, coconut, guava, jackfruit, mangos and olives. Highlights key innovations in citrus cultivation, from genetics to precision agriculture and integrated pest management (IPM). Covers advances in breeding and cultivation of a range of soft tropical fruits, including banana, kiwifruit, lychee, papaya, pineapple and pomegranate. Broad coverage of key stone tropical and subtropical fruits, including avocado, coconut, guava, jackfruit, mangoes and olives. 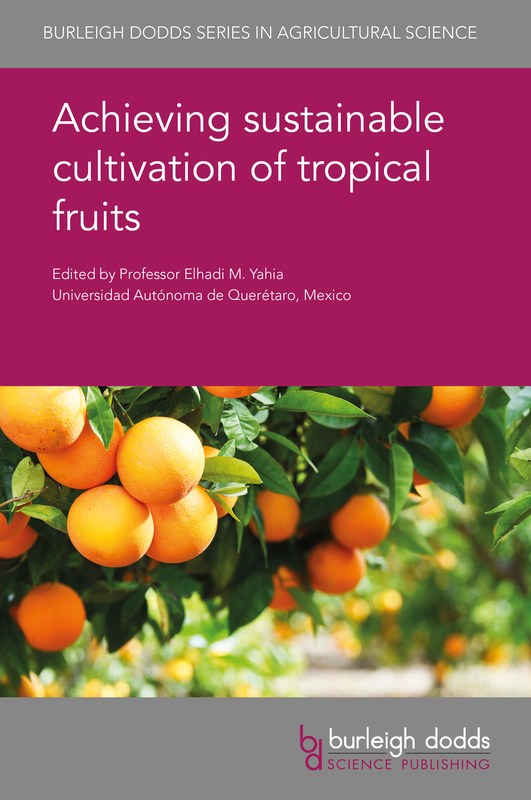 "With its experienced editor, choice of authors and topics, this promises to be much-needed and useful reference for researchers and growers of tropical fruits"